Cook the pasta according to the package instructions. Or you can cook it in vegetable broth for extra flavor. When the pasta is cooked to your liking, drain it, and rinse with cold water. Put the pasta back into the pot and set aside. While the pasta is cooking, prepare the rest of the ingredients. Tip: Chop all the vegetables first, and then the bacon. This way you can use just one cutting board for this recipe. In a medium bowl, toss the raw shrimp with 1 tablespoon of Cajun Seafood seasoning. If your Cajun seasoning doesn't contain salt, you can add pinch of salt to the bowl and mix well. Heat a large skillet and add the sliced bacon. Cook over medium heat for about 5 minutes, or until the bacon is crispy. Drain the oil into a bowl (reserve it for now!). Then transfer the bacon bits to a plate with a paper towel to absorb the excess fat. 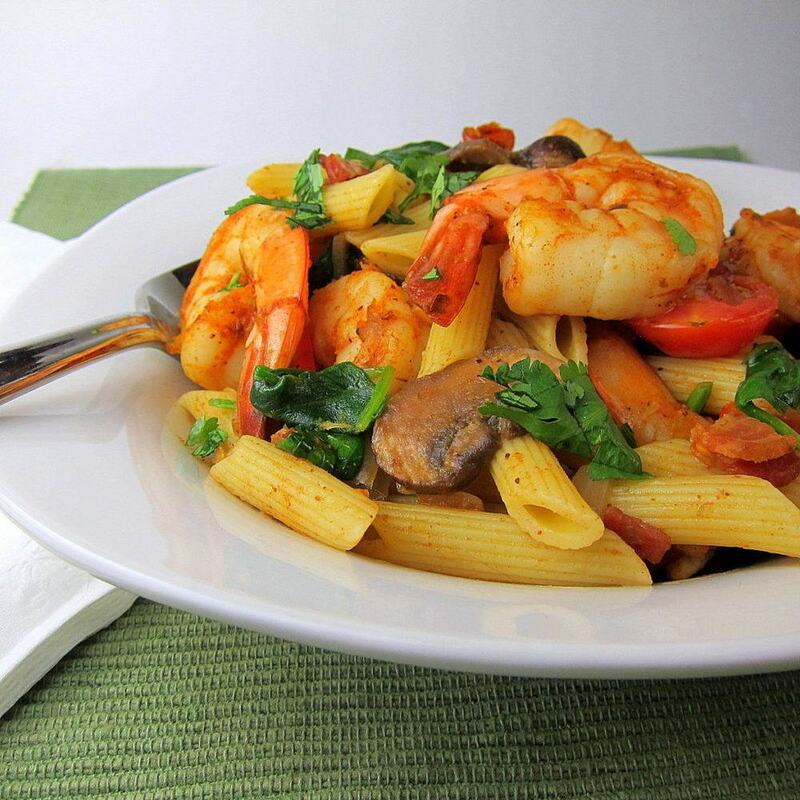 Add the seasoned shrimp to the same skillet and cook for 2-3 minutes on each side, or until the shrimp is fully cooked. The skillet should have enough grease on it from the bacon to cook the shrimp without sticking. Set the shrimp aside. Add 1 tablespoon of reserved bacon grease to the skillet. Add the chopped onion and saute for 5 minutes. Add the sliced mushrooms, and saute for about 5 minutes, or until the mushrooms begin to sweat. Add the chopped bell pepper, and cook for 2 minutes. Add the sliced grape tomatoes and the remaining 1 teaspoon of the Cajun seafood seasoning, stir, and cook for 1 minute. Add the spinach leaves and cook for 1 minute, or until they are wilted. Add the vegetable mixture to the pot of pasta and mix well. Add the bacon bits, cooked shrimp, and fresh cilantro. Mix well. Serve with shaved Parmesan on top.